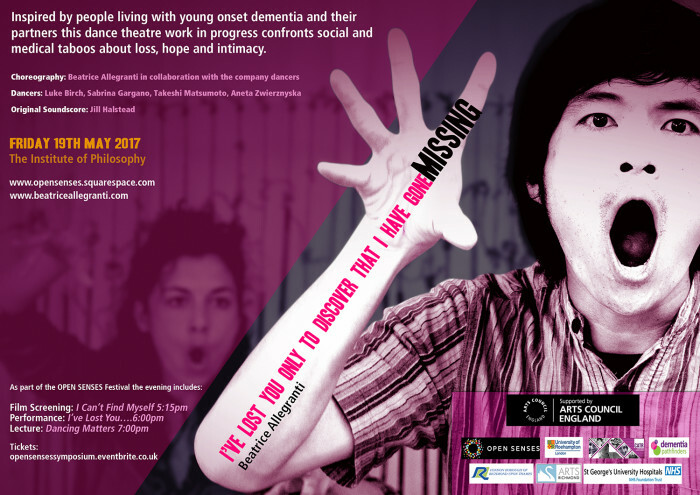 23rd February 2018: I’ve Lost You Only To Discover That I Have Gone Missing | Created Out of Mind at Wellcome | a special event for people living with young onset dementia and their family carers. 8th March 2018: Women Pioneers and Activists, Featured in article by Created out of Mind at Wellcome. 19th July 2018: Publication by Allegranti, B. and Weiss, H. ‘Eros, Sexuality and Gender’ in Body, Movement and Dance in Psychotherapy. July issue 1. 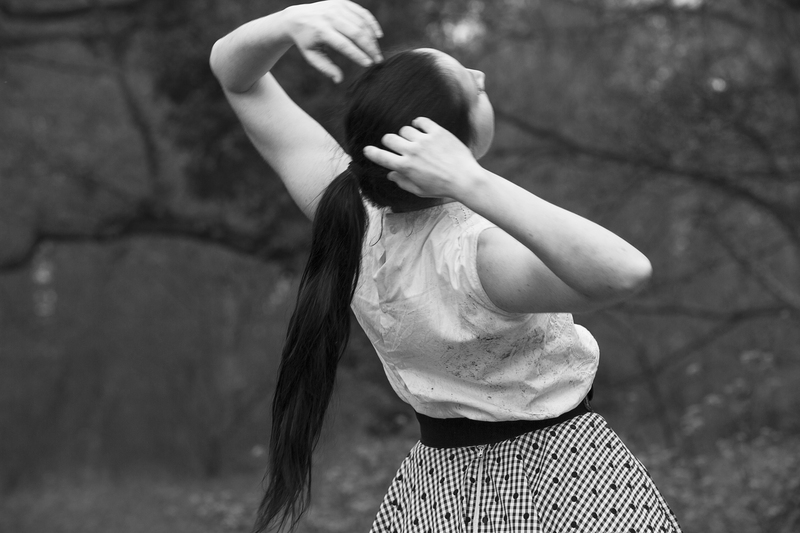 14th February 2019: Launch of Participatory Dances Residencies at Alexandra Palace and Merton Arts Space (subject to funding). Open to all people living with young onset dementia and their families. Email for inquiries. 7th March 2019: I‘ve Lost You Only To Discover That I Have Gone Missing Opening gala performance at Horizon 2020 Gender and Cultural Equalities Conference. Booking. 8th March 2019: Keynote | at Horizon 2020 Gender and Cultural Equalities Conference. Booking. 21st March 2019: Beatrice Allegranti contributes to ‘Neurodiversity and Performance’ Public Panel discussion at the University of Winchester, Centre for Performance Practice and Research. 24th -30th July 2019: Beatrice Allegranti Residency at Tokyo Metropolitan Theatre, Japan including: Workshops, Lectures and Keynote. Booking link will be posted in 2019. 26th September 2019: Beatrice Allegranti discusses her work on radio and online for BBC Music Day. Weblinks and details posted here in 2019. 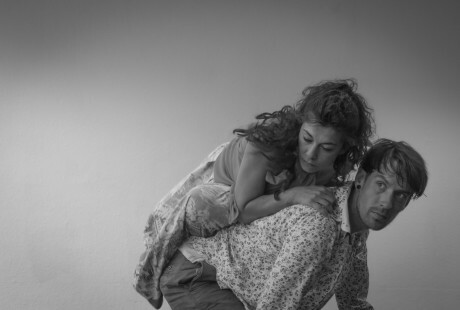 1st – 6th October 2019: Bergen, premier of I’ve Lost You Only To Discover That I Have Gone Missing - full production. Booking link will be posted in 2019. Further UK dates to be announced for the full production of I’ve Lost You Only To Discover That I Have Gone Missing including pre-performance workshops with the artistic team. 18th January 2020: Rivershouse Barn Arts Centre | I’ve Lost You Only To Discover That I Have Gone Missing – full production. Booking link will be posted in 2019. Further tour details will be posted June 2019. 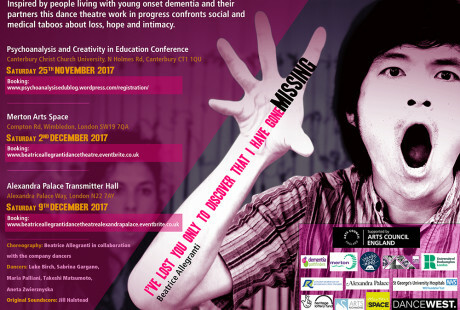 19th January 2017: Project Launch - I’ve Lost You Only To Discover That I Have Gone Missing Arts Council England with project manager Manuela Torri and Project Partners: Dementia Pathfinders, St Georges NHS, Arts Service – London Borough of Richmond Upon Thames. 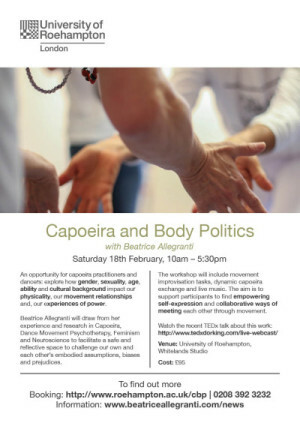 18th February: Capoeira and Body Politics Workshop | University of Roehampton. 5th April: Workshop & Seminar with Dr Jonathan Silas | Embodied Signatures: A Neurofeminist Investigation of of Kinaesthetic Intersubjectivity in Psychotherapy and in EverydayLife |University of Edinburgh. 17th March-28th April: Participatory Dances with live music for people living with young onset dementia and their partner/spouse/carer at the Ply Gallery, Hornsey Arts Centre. There are still a few spaces available. Please email if you would like to take part. This is an Arts Council England Funded project and is free to take part. 17th May: Performance Extracts I’ve Lost You Only To Discover That I Have Gone Missing and Participatory Dance Workshop | St Georges Hospital, Young Onset Dementia Support Group. 16th June: Performance of I’ve Lost You Only To Discover That I Have Gone Missing & talk | 12:00-2:00pm, as part of the Dementia Action Alliance Day | Ply Gallery, Hornsey Arts Centre. 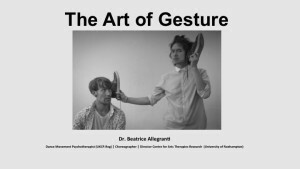 14th July: Talk | The Art of Gesture, Talk & Workshop, 3:00-4:30pm | Wellcome Collection. 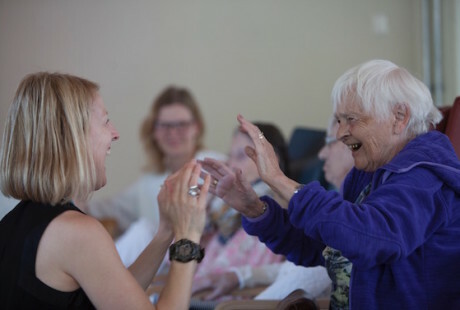 23rd-28th June: Participatory Dances with live music for people living with young onset dementia and their partner/spouse/carer at Merton Arts Space. There are still a few spaces available. Please email if you would like to take part. This is an Arts Council England Funded project and is free to take part. 1st-14th August: Capoeira Lab – Participatory Practice Based Research Sessions | University of Roehampton. Email if you would like to take part. 19th September: Guest Speaker at Dementia Action Alliance, Merton. 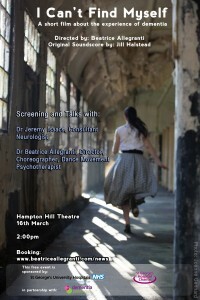 Introducing the Participatory Dance Project and the forthcoming performance on the 2nd December at Merton Arts Space. 2nd-5th November: Presentation & Workshop of interdisciplinary research – Embodied Signatures:A Neurofeminist Investigation of Kinaesthetic Intersubjectivity in Psychotherapy and in Everyday Life | American Association for Dance/Movement Therapy, Annual Conference, San Antonio, Texas. 23rd-25th November: Performance: I’ve Lost You Only To Discover That I Have Gone Missing, Film Screening: I Can’t Find Myself, Lecture: Making Sense of Tangled Losses With/in Dementia |Psychoanalysis and Education: Creativity in the Psychoanalytic Process and in Lifelong Learning, Conference at the Canterbury Christ Church University. February 2018: WIP at Dance West, Lyric Hammersmith – Booking Information Released inn the New Year. March 2018: Created Out of Mind at Wellcome – Booking Information Released in the New Year. 15th December 2017-10th January 2018: Capoeira Lab Fieldwork in Salvador De Baiha, Brazil| Supported by Santander Grant. Beatrice Allegranti Dance Theatre presented their new work-in-progress at the Open Senses Festival and Symposium. The work is directly informed by a collaboration with people living with the rare diagnosis of young onset dementia who have offered us poignant and often overlooked insights into their lives. More details on the project page. Beatrice Allegranti is marking 20 years of practice as a dance movement psychotherapist, choreographer, educator and researcher. Her work on embodiment has influenced a wide range of professions and practices including shaping the profession of dance movement psychotherapy and informing the arts therapies, counseling and psychotherapy, dance, performance studies, capoeira and neuroscience. By way of celebrating her work several organisations across the arts, health and education will be hosting a series of professional developments workshops in 2017. The workshop will take place in the Spring of 2017 – date and booking link will be posted here soon. An opportunity for capoeira practitioners and dancers: explore how gender, sexuality, age, ability and cultural background impact our physicality, our movement relationships and, our experiences of power. 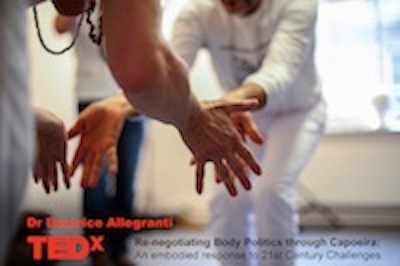 Beatrice Allegranti will draw from her experience and research in Capoeira, Dance Movement Psychotherapy, Feminism and Neuroscience to facilitate a safe and reflective space to challenge our own and each other’s embodied assumptions, biases and prejudices. 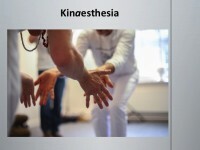 The workshop will include movement improvisation tasks, dynamic capoeira exchange and live music. 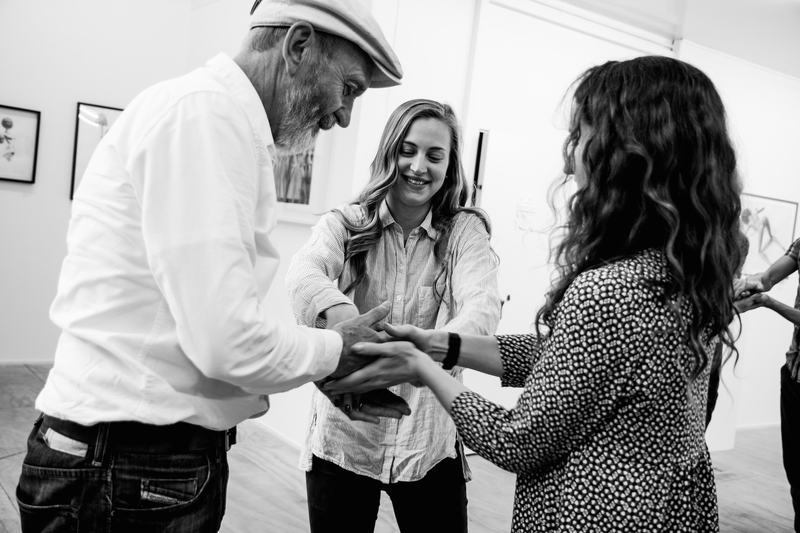 The aim is to support participants to find empowering self-expression and collaborative ways of meeting each other through movement. Watch the recent TEDx talk about this work. 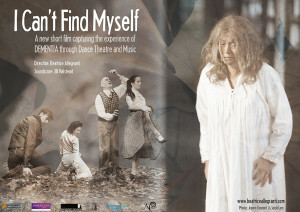 Following the successful 2015 UK PREMIER of I Can’t Find Myself at the Olympic Studios Cinema in London, Beatrice Allegranti’s new short film is touring the UK and Norway including: Bergen International Festival, the University of Edinburgh, Old Medical School and Hampton Hill Theatre in partnership with Dementia Pathfinders and St George’s NHS, as part of the Embodying Social Justice Conference, University of Roehampton, as part of the Medical Imaginaries Seminar, University of Bergen, at the Nordic Network for Gender, Body and Health, Bergen, Dementia Pathfinders Annual Presentation of the Margaret Butterworth Awards 2016 for excellence in dementia care. The film is available for screening in arts, healthcare and educational contexts. Email through the contact page for more information.